1. Why is water conservation important? Water, a common resource that many Canadians may take for granted, is essential to our daily lives. It is necessary for our survival; for drinking, growing crops, supporting our environment and powering our homes. Water, while abundant in Canada, is not as abundant as many may think. Canada is home to 20% of the world’s freshwater and 6.5% of the world’s renewable fresh water supply. This may be perceived as a more than sufficient supply to support Canada’s widespread population, however, the availability of these resources depends on the direction of flow and the quantities of water accumulated. Furthermore, the quality of water is as important as the quantity of available water, especially when it comes to drinking water. 2. Don’t Canadians have access to huge amounts of clean drinking water? The alarming fact is that approximately 60% of Canada’s freshwater resources flows northward away from southern Canada, where 85% of the population resides and most of the economic activities are located. Here in southern Canada, the Great Lakes watershed is under very high threats of pollution, habitat fragmentation, overuse of water, and invasive species as well as moderate threats of habitat loss, climate change and alteration of flows. Thus, with only 2.6% of the world’s water resources available to southern Canada and these resources being under serious threats, it is necessary to rethink our perception of endless water abundance, and adapt the concept of water conservation and preservation. 3. 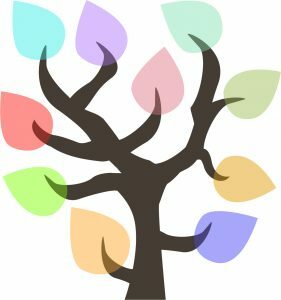 What is the health status of the watershed where I live? The WWF interactive watershed reports show regional information including the threats and health concerns of Canada’s watersheds and sub-watersheds. 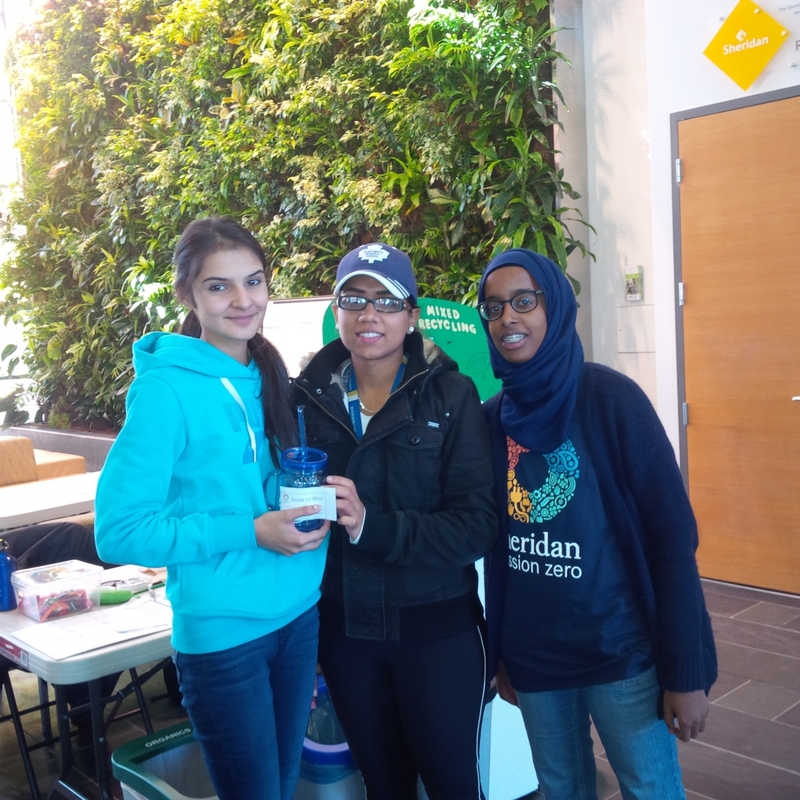 Check out the website to learn about your watershed! 4. What is water used for at Sheridan? How does Sheridan’s water use compare to other schools? Here at Sheridan, water is used for heating and cooling of buildings, domestic water use purposes and educational activities. An analysis of Sheridan’s water consumption showed that compared to other institutions of higher education in Canada, Sheridan ranked 13th out of 16 schools, in total water used per year, while having the 6th highest student and staff populations out of the 16 schools. This means that we have quite low water use per our campus population. However, that does not mean that we should not conserve water and aim to improve our behaviour and practices. 5. Which Sheridan campus uses the most water? Sheridan’s largest campus, the Trafalgar Campus, undoubtedly consumes the largest volume of water and has shown an annual increase in water consumption every year since 2011. In comparison, the second largest campus, the Davis Campus, which also has a high water consumption relative to the smaller campuses, has managed to achieve annual declines in total water consumption since 2010. 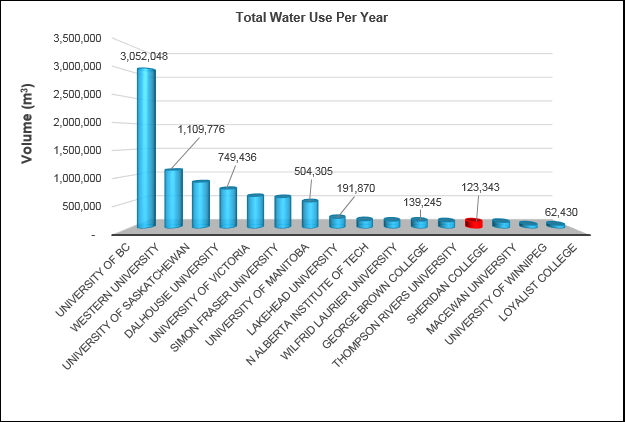 The Hazel McCallion Campus, though small in total area, also shows increases in total water uses every year since it was opened in 2011. 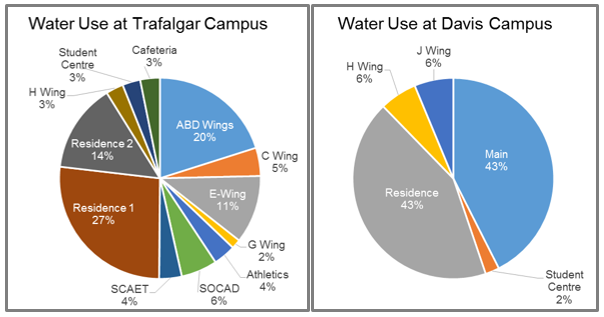 A further detailed look into water uses of individual campus buildings has indicated that the student residences at both the Davis and Trafalgar Campuses, use the most water among all buildings. That is probably due to the fact that the residences tend to be occupied for more hours than other Sheridan buildings. In addition, students are taking showers and washing clothes in the residences, which uses quite a bit of water. However water use in the residences have managed to stay fairly consistent over time. The pie charts below show a breakdown of water use by building for Trafalgar and Davis Campuses. 6. 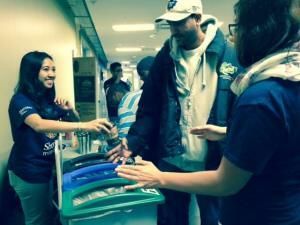 How does water conservation fit into Sheridan’s sustainability goals? Demonstrating to students, employees, partners, community and the world how a 21st century organization carries out its core operations and advances long-term institutional objectives while navigating a forward-looking, informed, evidence-based sustainable path. 7. In what concrete ways is Sheridan trying to conserve water? While Sheridan’s water consumption varies from campus to campus and building to building it is important that we strive to reduce our water use in any way possible. Some of the current water saving aspects of the Sheridan campuses are; its low flow automatic sensor faucets, air cooled refrigeration units and ice machines, lack of irrigation systems, high efficiency front loading laundry machines and closed loop heating and cooling systems. Sheridan also works to manage water use by: monitoring consumption by campus; identifying inconsistencies; maintaining faucets, fixtures, and HVAC systems; and finding and fixing any leaks. Students and staff can also play a role in minimizing their impact on water resources at Sheridan, by simply turning off all non-automatic faucets after use and reporting any leaks found throughout the campuses. The same can be done at home. 8. What can I do to reduce my water footprint? You can conserve water at Sheridan and at home by turning off the tap when it’s not in use and taking shorter showers. For example, you can turn off the tap while brushing your teeth, lathering your hair with shampoo, and shaving. You can also report leaks to Sheridan facilities staff at the email addresses below or to your landlord if you live off campus. Don’t forget to bring your reusable water bottle to campus! You can fill it with cold, clean, filtered water at a number of water bottle refill stations across Sheridan campuses. Being aware of what products should and shouldn’t be poured down the drain is another way to ensure that our water resources are being protected for future use. For example, in programs where water is used for lab exercises or art purposes, students should consult instructors before disposal of chemicals and materials down the drain. Substances such as grease, oils, paints, fertilizers, pesticides, medication, cleaners as well as solid materials should not be put down the drain since most wastewater treatment facilities are not equipped to treat for these substances. By conserving the amount of water we use and protecting our valuable water resources we can help maintain Canada’s abundant fresh water supply and ensure fresh clean water is available for future generations.